The Rangers were looking for a top catcher in August 1990 and the team they were talking with was the Cubs, according to The Chicago Tribune. The Cubs had Damon Berryhill or Rick Wrona. The Rangers had Pete Incaviglia and a couple minor leaguers, including left-handed pitcher Eric McCray, The Tribune wrote. The deal never got done. The Rangers didn't get their catcher and McCray never made the majors. By that point, McCray had been with the Rangers for three seasons, since the Rangers selected the hurler in the 10th round of the 1988 draft. The Rangers selected him out of Farmerville High School in Louisiana. He played that first season with the Gulf Coast League Rangers, doing well. McCray started 11 games, posting an ERA of 1.44. McCray moved up to single-A Gastonia for 1989. He went 7-7, with a 2.52 ERA in 22 starts. He also struck out 110. For 1990, McCray hit AA Tulsa. He went 8-7, but his ERA increased to 4.21 in 25 outings. But he still struck out 98. That was also the year McCray was talked about in the possible trade for a catcher. That fall, McCray landed in the Florida Instructional League. In one outing, McCray pitched three innings and struck out seven, according to The Sarasota Herald-Tribune. 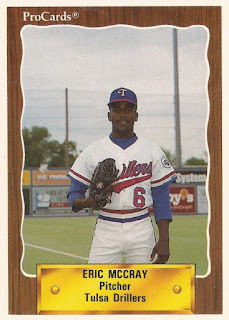 McCray spent the next season, 1991, McCray pitched largely back at Tulsa and mostly in relief. In 21 outings, McCray posted an ERA of 4.65. He also started two games at high-A Charlotte. His career in affiliated ball ended in 1992, getting into only two games, those games back in the Gulf Coast League. McCray is recorded as pitching in the North Central League in 1994 with the Marshall Mallards, then ending his career in the Big South League in 1996 with the Pine Bluff Locomotives.